FFT5 Chipboard based acoustic deck overlay boards for timber floors with good airborne and excellent impact performance. Robust Detail FFT-5 resilient acoustic floor systems can be used in E-FC-1, E-FC-2 & E-FS-1 separating floors. 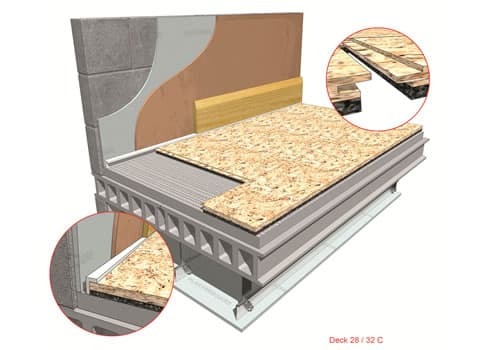 Robust Detail FFT5 resilient overlay shallow platform floor systems can be as little as 19mm thick and minimise construction heights whilst complying with statutory regulations. FFT5 resilient overlay shallow platform floor systems offer a more aesthetically pleasing finish to a screeded floor which is used in many concrete floor applications. When installed in line with the guide lines provided, the JCW Acoustic Batten will surpass any requirements set out in Part E of the Building Regulations. For a price on our FFT5 acoustic deck or more information on this product call us today on 01204 548400.